Keeping it interesting in the hangar | Avionics Blog – Avionics to the Max! Maxcraft’s full hangar with an array of different style aircraft. Maxcraft’s hangar floor showed a lot of variety this week, with aircraft ranging single engine Cessnas, to turboprop corporate planes, and executive rotorcraft. The Eurocopters you see right and centre are in for G500 Primary Flight displays, GTN Navigators, and Mid-Continent electronic standby instruments. The Pilatus PC-12 on the far left received not only a GTN750 with XM satellite and Garmin Flight Stream options, but also a completely new interior and paint job courtesy of our friends at Port Aircraft Interiors and Upper Valley Aviation. The Beechcraft Bonanza is in for regular maintenance, and a Cessna 152 (just out of frame – not pictured) now has a completely new panel featuring an Aspen EFD-1000 Primary Flight Display, and a Garmin GTN650 Navigator. 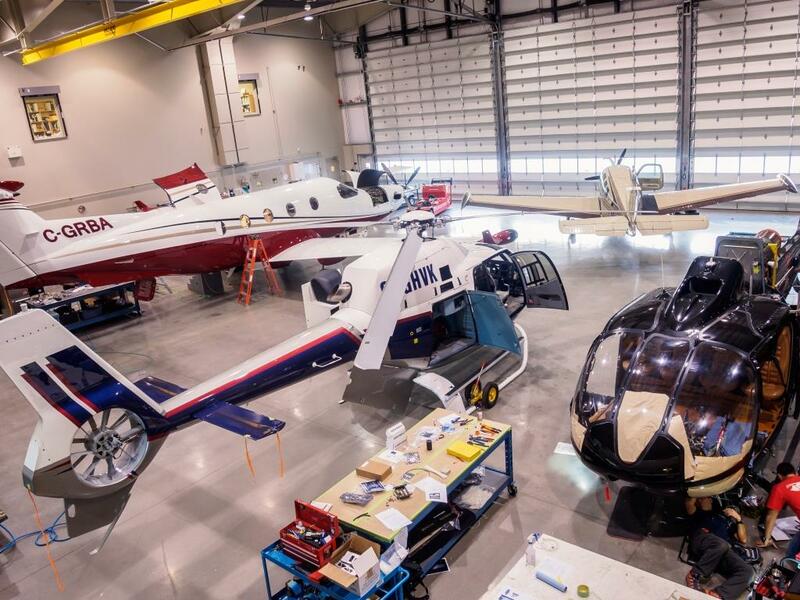 There are a lot of different kinds of aircraft with different configurations and purposes in this photo, and the variety you see here reflects Maxcraft’s broad capability to service, upgrade and/or retrofit nearly anything we can fit in the door (and a few things that don’t). This entry was posted in Avionics News and tagged aircraft, airplane, Aspend EFD-1000 Primary Flight Display, Avionics, Beechcraft Bonanza, Canada, Cessna 152, cockpit, efis, eurocopters, facility, flights instruments, G500, Garmin GTN650 Navigator, glass cockpit systems, GPS, GTN Navigaors, GTN750, hangar, Helicopter, Maxcraft Aivonics, Mid-Continent, parts, Pilatus PC-12, Port Aircraft Interiors, Primary Flight Display, tcas, upgrades, Upper Valley Aviation, VHF radios, XM satellite. Bookmark the permalink.